SPONSOR A POST THOUGH THE DOOR COUNTY NETWORK™. BUILD AWARENESS AND IMMEDIATE LEAD GENERATION. The following post had over 8,500 views, over 500 likes and 290 clicks to the link included in one day! In two days – another post reached over 27,000 with almost 2,000 likes and other engagement. 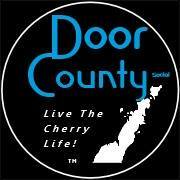 The Door County Digital Broadcast Ad Network Over 39,300 in our FB channel. An analogy I like to use, if you want to reach golf fans you’d use the Golf Channel which golf fans have an affinity for, we reach 10’s of 1,000’s of Door County enthusiasts worldwide while they dream, plan, and scheme their next visit. And with our attractive Door County branded ads we enjoy ad engagement levels aka CTR’s 3 to 13X ad placed nationally in same categories. Co-branded ads. As an exceptional ‘brand’ influencer. We present local opportunities, experiences, real estate to those (targeted) likely consumers/buyers nationwide with attractively branded ads pulsated to DC fans anywhere any device. Just ‘dropping a link’ in front of our crowd get attention and when it’s promoted engagement goes way up. Long ago we sensed that 99% of the people that love Door County aren’t here 99% of the time. Seeing the coming wave of all things digital in 2007 we started developing our digital media channels as a form of entertainment. Example; started in 2008 our team grew the original Door County FB page to a large national base of Door County enthusiasts and it’s still growing. We use it to entertain the nation – lots of pictures, video and info about Door County. Most posts have sponsors – and these are available to our regular clients. Direct posts and post shares are also available on a limited basis. Our engagement rates are very high compared with national numbers. Digital has passed last centuries radio and print in effectiveness long ago. Just $149 for a promoted post in front of our community of 39,500 Door County enthusiasts and growing. You can be up and running to an interested regional or national audience within hours. Contact us today to see how you can leverage our channels and our national fan base. Inquire today. 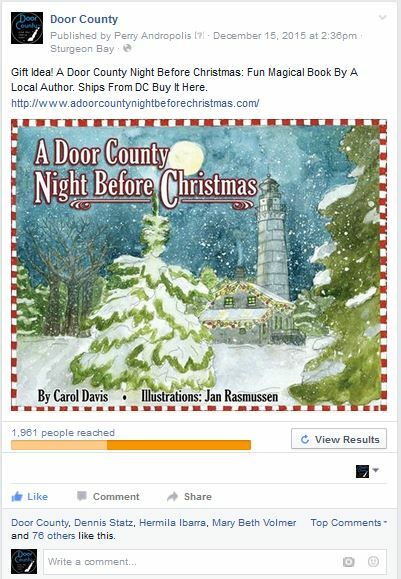 This sponsored post reached more 32,966 stated Door County fans nationally in two days. With more than 2,041 engaging with the post in those 2 days. Live links for real time lead generation 24/7. Updated since the screen snip. It has multiple digital channels we digitally broadcast through. Reaching people everywhere. 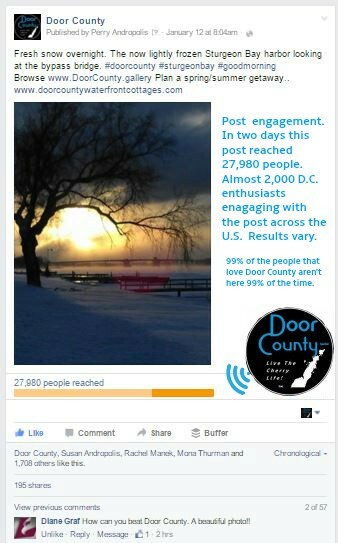 This direct post reached more 1,961 stated Door County fans nationally in two days. It had a live link back to the clients online store for real time browsing and buying 24/7. 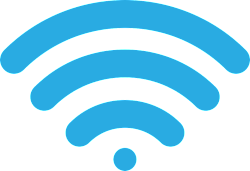 Multiple digital channels were used.